Email is the best way of sending any file or data over the internet. We all use email for our purpose of transferring data and file. Nowadays many email serving companies are there, but there is some limitation to send large files by Email. Many email servers refuse any file or attachments which exceed 10 MB in size. So To Send Large Files By Email first you will need to upload the attachment on a file storage as well as sharing services like google drive or drop box and then you have to share the link of that storage drive to your recipients to download the file from that file storage. There are few other services or ways to send large files by Email. Sometimes email service providers give you an alternative method to send large files. Here, in this post I am sharing with you some ways to Send Large files Over the Email. First let’s take a look at the standard & Max size of an Email Attachment. Normally most of the email service providers allow their users to send a file of size 10 MB. Some email providers may set a more lower limit, but it’s the standard size of an email attachment. If you are a Gmail user then you can attach up to 25 MB to send to other Gmail user only. But if you send that attachment to other servers, then it may be rejected as many servers are configured to accept only the attachments up to 10 MB. Here are the some services that you may use to send Large files over Email. If you are a Gmail user, then you can use its cloud storage that is Google Drive to store any large files and then send it to anyone you want. 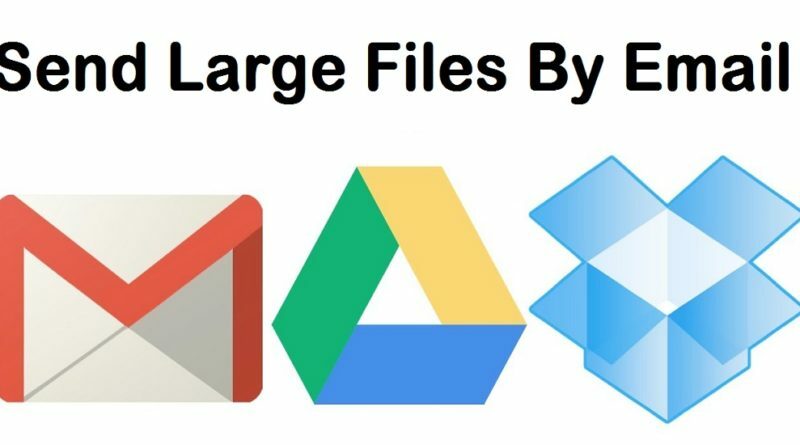 Just place your large file into the Google Drive folder and that file will be automatically uploaded on your Google drive account. To send attachment, click on the ‘Compose’ on the Gmail window and then click on the symbol of Google drive which is at the lower end of the screen and it will be named as ‘insert files using Drive’ when you place your mouse cursor on it. Actually when you attach a large file from Google Drive, it won’t take any space in the Gmail. It only sends the receiver a link to download that file from the drive. Microsoft uses cloud storage SkyDrive. So the Users of Hotmail and Outlook can use SkyDrive to add a large file and then share it to anyone they want. In Hotmail & Outlook when you attach any file of size more than 25 MB, it will automatically prompt you to the SkyDrive account. Your recipient will receive the link of that file in their inbox to download it from SkyDrive. File Dropper is a great service to send large files over the email. It is actually not any email provider, even you don’t need any account here. You will receive a link of each of the files you uploaded using it. Then just copy that link address and paste it to the mail and send it to your recipient. You can upload up to 5 GB. With TransferBigFiles, you can integrate with your Gmail account easily with Chrome extension. Also it has features like you can add passwords to your downloads or you will get notification when the files are being downloaded with anyone. Even you can set a custom expiry date to the files. To enable these features you need to sign up first. YouSendIt is the best way to send large files over email. First you have to upload a file here and put an email address where you want to send that file. YouSendIt automatically sends a link to that email address to download the file. The free version of it only allows you to upload 50 MB of file size. But if you are moving into a paid version then you can upload larger files here. Also, you can enjoy the free trial period of 14 days. It is the best business solution. So with the help of these services, you can easily send large files over email. There are also other options available, but these are the best ways that you can follow to send any large files over Email. Now, you have the best options in front of you, choose anyone and start sending.